On 12 May 2009 Revd Dr Chris Wright, International Director of Langham Partnership International, delivered Redcliffe College’s Annual Lecture in World Christianity on the subject of ‘The Bible and Mission’. To a packed audience, he set out a ‘missional hermeneutic’, a way of reading the Bible ‘missionally’, and then applied that approach to the book of Jeremiah. 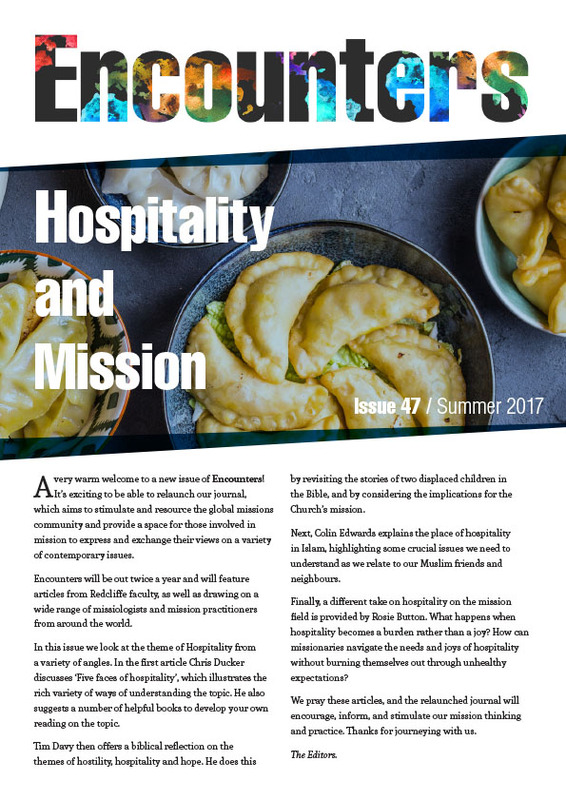 This issue of Encounters revolves around Dr Wright’s excellent lecture and explores the idea of a missional reading of the Bible, in theory and practice. As well as the lecture and question and answer session transcribed in full, the edition also includes a number of responses from a variety of contexts. It has been a truly global venture with contributions from Malaysia, India, Colombia, Asia, the US and the UK. John Risbridger and Krish Kandiah consider missional hermeneutics in the setting of the UK Church. David Spriggs writes on the relationship between the Bible and missional engagement in the ‘public square’. Eddie Arthur reflects on what a ‘missional hermeneutic has to say to those who translate and disseminate the Scriptures’. Brian Russell and Milton Acosta discuss missional hermeneutics as a method of reading the Bible. Finally, Anthony Loke and Rabbi and Chitra Jayakaran share what a missional hermeneutic might mean for their own contexts of Malaysia and India, respectively. Every edition of Encounters is a collaborative effort, but several parties must be singled out for special thanks. We are of course immensely grateful to Dr Wright, both for giving the lecture itself and also for allowing us to reproduce it here. The contributors have had to work to a very tight deadline, but I’m sure you will agree they have provided us with much excellent biblical and missiological reflection. My special thanks must also go to Diane Carter for her skilled transcribing of the lecture. I trust you will enjoy this edition of Encounters. Please read, reflect and join in the conversation. Lecture: “Prophet to the Nations”: Missional Reflections on the Book of Jeremiah. Lecture question and answer session. A missional hermeneutic and Scripture engagement. Jeremiah and mission in the public square. What does mission in exile really look like? Missional hermeneutics: some opportunities and questions. Missional hermeneutics in a Malaysian context. Missional hermeneutics in an Indian context. Book Review 1: Bible and Mission: A Conversation Between Biblical Studies and Missiology. Book Review 2: Power and Poverty: Divine and Human Rule in a World of Need.